When I say "find a cheap room", keep in mind that cheap is a relative term. 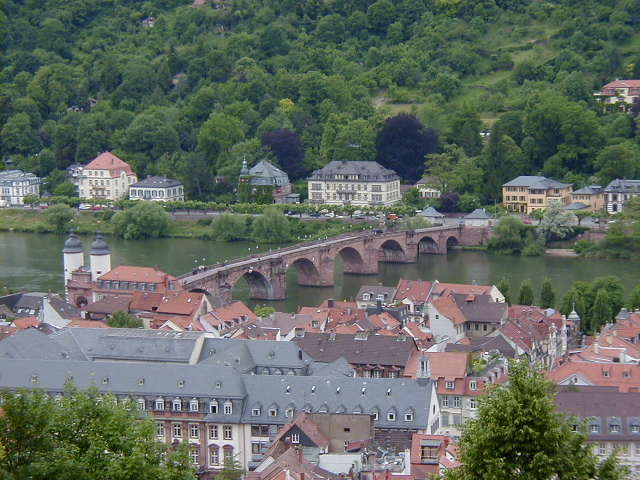 The best I could do in Heidelberg in late May was 90 deutschmarks (DM's), about $45 at the time, in the Hotel Garni Am Kornmarkt. A small but decent room with breakfast included. Breakfast in Germany is usually cold cuts and bread, but this place also had cereals, milk and yogurt. This is where I found out I liked yogurt and meuseli. Not something I want to eat every meal, but for breakfast I like it better than cold cuts and bread. 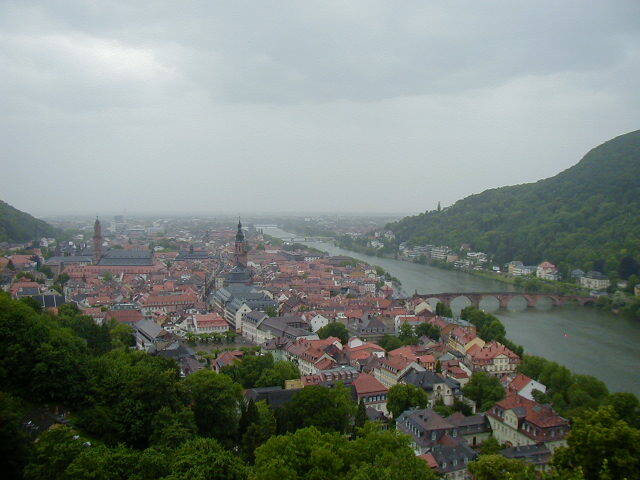 Old town Heidelberg is a pretty place, but quiet while I was there, Sunday to Wednesday in late May. It has a large university, but I think this time was between semesters. I went sight seeing but did little else. 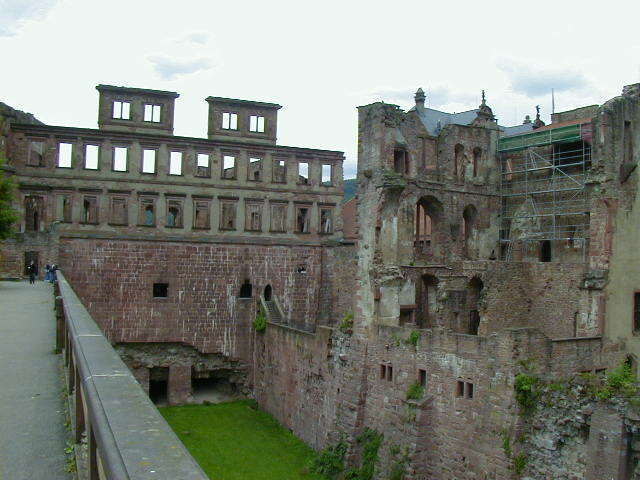 Heidelberg has a really cool ruined castle, Schloss Heidelberg, that is the highlight of the sights. 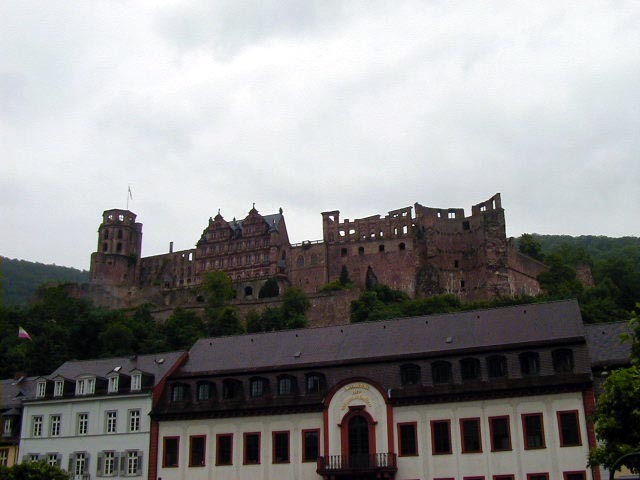 I had just arrived in Europe so I was excited about castles. 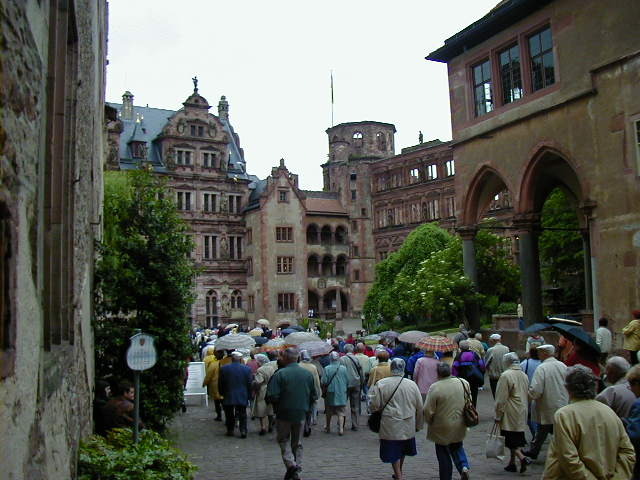 The oldest remaining structures of Schloss Heidelberg date back to the 14th century, and it has had a difficult life. 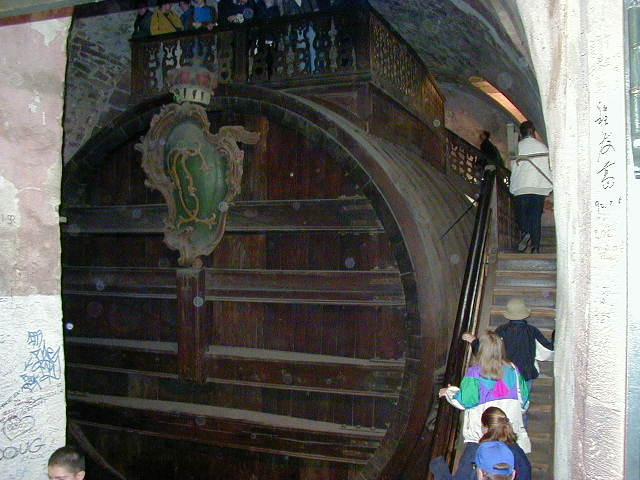 It was sacked in 1622 by Catholics during a dispute with the Protestants, and destroyed in 1693 during the Thirty Years War. 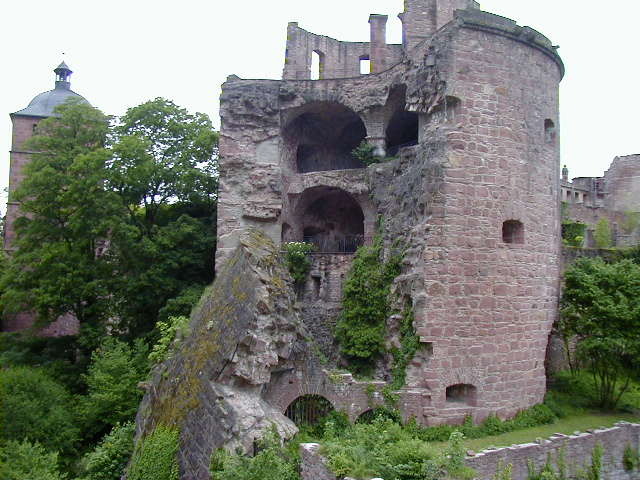 It also burned a couple of times, and a massive defensive tower with ten meter thick walls was split open by French artillery when Napolean's army was passing through. When I saw the remnants of the defensive tower I was really impressed by what cannonballs were capable of doing. 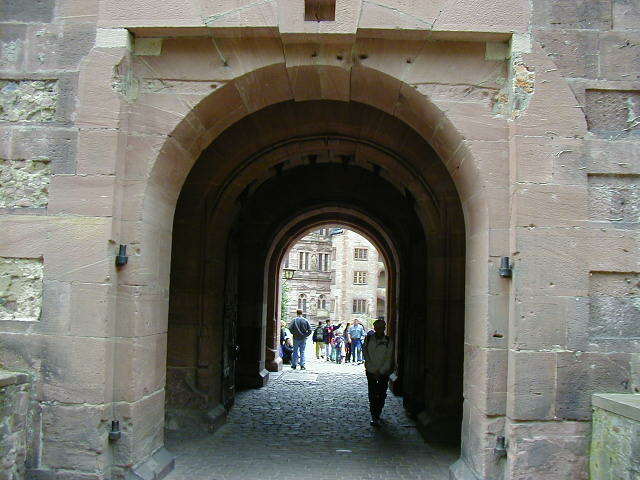 Castle entrance, deep and with heavy gates that can be quickly lowered on both the outside and courtyard side of the entrance. Undesirable types could be trapped between these two gates and nasty things could be dropped on them from trap doors above. 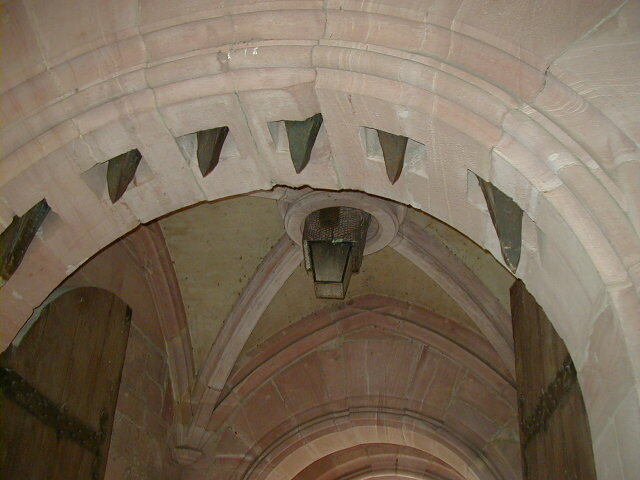 Castles could be tricky places. 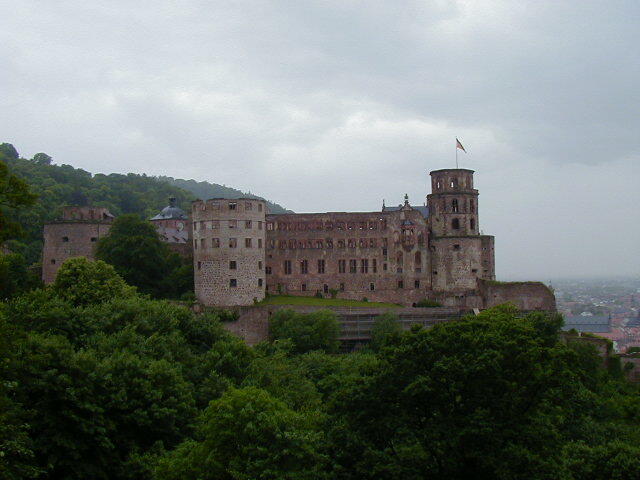 That's all for Heidelberg. Kind of a dull start I admit. The trip got more interesting as I progressed, starting with Berlin.